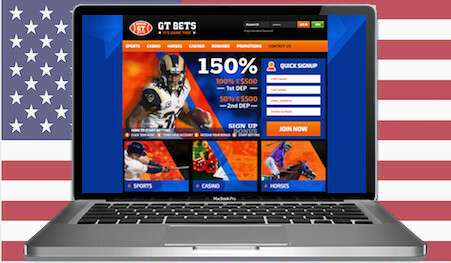 Everyone loves a good underdog and GTbets has been swinging at the fences for a few years now offering everything possible that you’d ever want to gamble on. Add that with tons of bonuses and rewards every month, and you’ll definitely want to go check them out. Here we have a great USA sportsbook & casino that’s been gaining ground in the market since their launch in 2011, mostly thanks to their solid customer service and wide array of betting options. Of course, it doesn’t hurt that GTbets also offers every major North American racetrack, tons of Las Vegas style table games, and a huge list of virtual slot machines. This place has pretty much every gambling product except live poker, which is quite rare to find in America these days. They accept tons of different deposit methods and take financial transactions very seriously, guaranteeing that your funds are always safe and secure. And just wait until you hear about their never-ending bonuses and rebates that you can cash in on. This 100% honest and unbiased review of the GTbets Casino will tell you everything you’ll want to know before signing up with them, like the fine print on their rebates, strength of mobile product, and how you qualify for their exclusive promotions. There are tons of great bonuses at GTbets to get in on whether you’re just signing up with them or have been playing there for a while. Starting off, you’ll get an immediate 150% Welcome Bonus up to $500 on your first real money deposit, which will then be followed by a 50% bonus up to $500 on your next one. However, if you stung them for a big win on your first transaction and requested a withdrawal, they won’t give you the second bonus as punishment for your victorious ways. The minimum deposit amount to qualify for the Hello Offer is $35 and there’s a 10x rollover which is the smallest wagering requirement you’ll find out there today. This generosity is balanced out by the fact that any wagers with odds over -300 will not count towards the rollover so you’ll have to be careful what you bet on. Things then get a little complicated with the GTbets Reload Bonuses because you have to meet 3 requirements in order to get it. First you must have lost 75% of your last deposit amount and only have 25% of it remaining. Second, you will not get it if your last financial transaction was a withdrawal, and thirdly your account must be “qualified” to get bonuses. That’s an awful lot of things to keep track of when you’re trying to figure out if you’re eligible for some free cash so it’s probably best to just call into their customer service center to confirm things with them directly. Those of you who like to play on the felt can look forward to a 10% Weekly Casino Rebate that will automatically be put into your account every Tuesday. It’s a straight cash bonus with no rollover that’s eligible to anyone who hasn’t won there in the last 30 days, or requested a payout in the last 30 days. It’s always nice to be rewarded but these terms are kind of one-sided in favor of the House so we hope that they update them soon to be more player-friendly. They have the same 30 day terms and conditions on their Racebook Rebates, which can give you 15% cashback on all of your straight and exotic wagers. This rebate is monthly and will be issued on the 1st of the month to anyone who hasn’t won too much or requested a payout. The complicated terms are present in a lot of their other promos too. For example, sometimes there are No Deposit Bonuses but there’s a maximum win amount of $100 with a $60 bank wire fee, thus making your total win a meagre $40. Why even bother? This is a pretty strict term that most will not enjoy. It’s pretty clear that GTbets does not like winners very much. As already mentioned, where GTbets really separates themselves from the crowd is the fact that they have a full sportsbook offering lines on all major sports and leagues. Whether you want to bet on the NFL, NBA, MLB, UFC, or NHL, you’ll find it all, as well as every major international sporting event from around the world. The GTbets Racebook is fantastic because they offer races on both thoroughbred and quarter horse, and offer all major USA and Canadian tracks – and even a few minor ones too. You can also find all of the most important international races of the year like the Kentucky Derby and there will be fixed odds on all of them, with both basic and exotic wagers being offered. Usually they have full track odds on the Win/Place/Show, however, you might find some limits especially if you’re a sharp better. Gamblers across the United States will be happy here if only for the fact that there are no tax deductions on your winnings and no declarations made to governmental agencies. It is absolutely your responsibility to declare your earnings. Then when you look at the GTbets Casino games list you quickly realize that everything is available here, with favorites like blackjack and roulette alongside niche ones like Keno and Scratch Cards. As you dig deeper into their website you’ll find Red Dog, 21 Burn, Craps, Pai Gow Poker, Baccarat, and many more table games you’ve probably never even heard of. As they have a full casino product you’ll also find close to 50 unique Video Poker machines with different versions of classics like Joker Poker and Jacks or Better. The titles then get wilder with All American, Aces & Faces, and Split Way Royal leading the long list of machines. Every online sportsbook across the U.S. has one thing in common: they all accept credit cards. It’s no different here and the “Big 3” of MasterCard, AmEx, and VISA are all approved deposit options. The GTbets Finance Team goes the extra step by announcing that you should really try to move money into your account with pre-paid Gift Cards, which have been a secret preferred method of the industry for years. You simply go buy a prepaid card at any store and use it to transfer the full amount into your gaming account – it’s really that easy. Now this place likes to consider itself cutting edge so it’s no surprise that you can make casino deposits with Bitcoin, up to a maximum amount of $10,000 per transaction. You can even make free withdraws with this method since it’s so easy for both sides to use and the fees are tiny. The cryptocurrency options don’t stop there however, and you can even use exotic coins like Bitcoin Cash and Litecoin, which are two great methods just like Bitcoin, but not as expensive to buy on the crypto exchanges so the amounts are easier to keep track of. Don’t worry, it’s simple to learn how to use them and you’ll be an expert in no time. They finish off their list of methods with a mysterious option called “Quick Cash” that you have to contact them about if you want to use. There’s a $100 minimum with it and a bizarre maximum amount of $630 that doesn’t quite make sense and has us very curious. Now we get to the fun stuff with the GTbets Mobile Casino that you can access from anywhere in America that has an internet connection. It has everything that you could possibly be looking for and is compatible with Android, Windows, and of course tablet computers like iPad and smartphones like Samsung. It automatically recognizes the type of device you’re on and optimizes itself for your screen and software so it looks awesome no matter what you use. They of course have all of the standard games you’ll be expecting like blackjack, craps, and roulette, along with a wide array of slot machines. However, what pushes this USA mobile casino to the top of the rankings is that it has a full sportsbook that allows you to bet on sports from the palm of your hand. Whenever the urge arises you can simply whip out your phone and place your wager in seconds, ensuring that you’ll never miss out on getting action again. You can even fund your account on the go, as well as put in payout requests when you win. So conceivably you can place a game from the stadium, win, and then have the funds back in your crypto wallet by the time you fight through traffic and get home. Technology these days is simply amazing. The GTbets reward system pays you back for your patronage through their separate website gametimerewards.com and they’re one of the rare casinos that actually gives you physical items as gifts instead of straight bonus cash. So for example, with 80,000 points you can get a Game of Thrones DVD set, for 130,000 points you can get an official NFL licensed football, and if you are able to log 560,000 points you can exchange them for a Playstation 4. The website also allows you to use points to enter sweepstakes and a thousand points can net you $25, 1,500 points can win you $50, and 2,000 points can get you $100…if you’re lucky. However, most players are going to want to go for the cold hard cash and this website of course allows you to do that as well. Starting with 2,000 points you can get $2 cash added to your account with no strings attached and then as you move your way up the ladder you can ultimately have a maximum of a million points that are able to be cashed in for $1,000, with various monetary levels along the way. It doesn’t take long to get up and rolling with GTbets: simply tap the green button below and then hit the “Join” button in the top righthand corner of their homepage. If you live in the U.S. and bet on sports you’ll definitely want to have an account with them funded and ready to go, or even if you just want to gamble on any of their other great casino games or racetracks. They’re quickly becoming one of the best operations in America today.